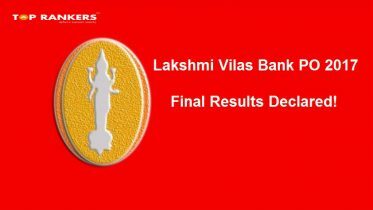 Lakshmi Vilas Bank will be conducting exams for the post if the Probationary officer and Probationary clerk in 2018. A vast number of people are appearing for these exams and it is necessary to solve the questions quickly and right to crack the exam in a stipulated time period. It is required to go about a method when writing the exams and requires applying the right strategies to solve the questions in order to achieve a higher cut-off. The exams are conducted online and contain objective questions. The time duration of the exam is 90 minutes or one and a half hour. 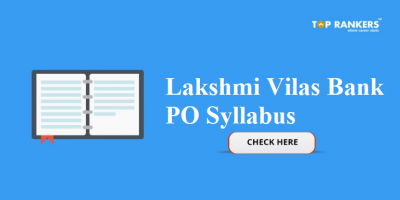 We will provide both section wise and overall Lakshmi Vilas Bank PO Preparation Tips for LVB PO 2017. There are some important points to be kept in mind while preparing for this exam. Speed is very necessary while solving this question. Swiftness is required to solve 150 questions in 90 minutes. There is no point in struggling to answer these questions longer than the given duration. Only practice can make one perfect. Efficient time management is necessary to solve 150 questions in 90 minutes. There is no point in spending the undesirable amount of time on one single question. If you are unable to solve a question, move on to another question and solve as many questions as you can in a short duration of time, leaving you with time for the tough questions. You need to go about each section in the right manner. Follow the below-mentioned tips for all the subjects. The Analytical Ability section has 25 questions on a difficulty level of easy to moderate. The analytical Ability section is divided into 5 parts. It has 5 questions on syllogism, 5 questions on linear and circular seating arrangement, 5 questions on Floor and rank, 5 questions on inequality, 5 questions on Coding and decoding. While answering the analytical ability section, it is necessary to answer the question that is easy to solve like the syllogism, inequality, etc. Do not begin with topics like coding and decoding, puzzles or seating arrangement that take a lot of time. The numerical ability section has 25 questions and has a moderate difficulty level of solving the questionnaire. The Numerical ability has different sections like Data interpretation, Series, Simplification, Inequality and includes miscellaneous topics like age and simple and compound interest, profit and loss, percentage, permutation and combination, time and work, speed and distance. The numerical ability section is time-consuming so go for those questions in the section that you are well versed with. Initially attempt questions like data interpretation, simplification and number series. It is advised to initially avoid time-consuming topics like profit and loss, age, area, average, boats and stream, partnerships, simple and compound interest. The banking awareness contains 40 questions that test your knowledge of banking. Banking knowledge comprises about 20-25 questionnaire, while the current affairs on banking and finance have about 15-20 questions of current affairs related to banking and finance. These questions cover subjects like types of accounts, modes of payment, different types of banks, money market, capital market, banking history, RBI and history of RBI, Basel norms. Other questions will include payments bank, bank wallets, appointments in banking and schemes, etc. Solving these questions will require adequate knowledge and guesswork won’t help here. Preparing these questions will require through knowledge and reading. The Computer and General Knowledge Section has a difficulty level of easy to moderate. Answering the section requires basic knowledge of computer including basic input-output questions, networking, DBMS, MS office, windows software, hardware, and internet. The Verbal ability has a difficulty level of moderate. It comprises of 30 questions. It consists of topics like reading comprehension, Cloze test and fill in the blanks, Para jumbles, Spotting error, etc. Start with questions that won’t take much time. 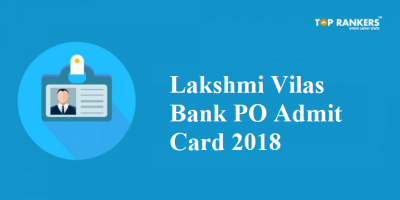 It is advisable to solve questionnaires like computer/ GK, Banking awareness and verbal ability to start with and eventually move on to analytical ability and numerical ability. The exam is not very difficult to solve and should be easy if you are well prepared. 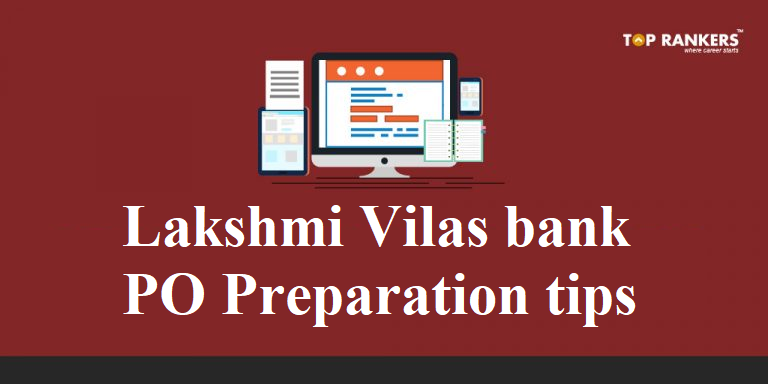 Check the below preparation tips for LVB PO as suggested by previous year’s Toppers. Do Proper Planning & Schedule and stick to it. Stay Organized towards your goal. 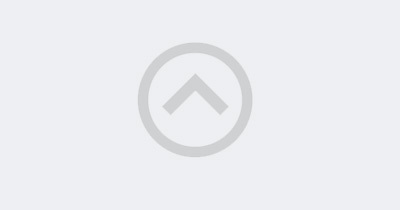 Solve at least 3-5 LVB PO Online Mock Tests on a daily basis. Practice questions from previous years questionnaire & Model papers. Clear all your doubts before the exam. Read newspapers to strengthen vocabulary. Solve Word Puzzles and numerical puzzles. Read Daily Current Affairs updates. Follow a regular Time Table. If you manage our time efficiently, you will be able to solve more than 100 questions and up to 120 questions in the given time frame. Efficient time management and accuracy is essential to get through in the exam.